Here I am, patiently waiting for my evening din dins, taking a nap on the computer keyboard. I’ve been swiveling my ears at every little sound, waiting for that doorknob to turn. When that happens, only goodness will follow. I’ve heard some sounds of commotion from the kitchen, where everyone is gathered. They seem to be excited about some piece of mail. It’s just about time for my human to walk through that door and give me the reward I deserve. What? Why do I deserve a reward? For existing, of course. I’m a cat, a superior being. I should be rewarded for being the handsome tabby fellow that I am. And maybe for being clever. My human might never have solved those two murders without me. Wait! Where’s my din dins? Why is she dumping that pile of mail on the desk? Okay, she’s stopping to rub my head…but my awesome purr isn’t making any difference. She’s leaving! I’d better see what this mail is all about. 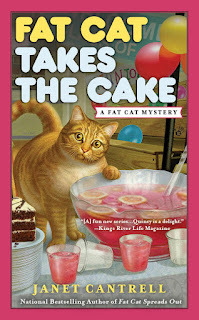 Please leave a comment that includes your email address for a chance to win a copy of FAT CAT TAKES THE CAKE. I’ll close out the contest at noon on Thursday, EDT. FAT CAT TAKES THE CAKE is the third mystery in the Fat Cat series. Includes dessert bar recipe and leash training tips for cats! Looking forward to reading fat cat. I like that cat. I'm really looking forward to reading this. I love cat personalities...and how we interpret them. :) Thanks for the chance to win. Quincy sounds like my Merrick. I can never get her her food fast enough. Thanks for the chance. Do NOT keep a cat from its dinner! Sounds like another fun read. Thanks for the giveaway. We have a cat who used to tolerate a harness and leash. He'd prefer to run loose, of course. I think he is part Hobbit--he's convinced there should be second (and third and fourth...) breakfasts and lunches and dinner. Great series - would love to win! Fat Cat should get his din din---he'd be much happier. Thanks for the contest. I do need to get started on Fat Cat's series. I have not read any of them yet. Quincy looks so much like my son's Boba Fett! Love the excerpt from the cat. I haven't read this series yet, but I'm looking forward to reading it. Love mysteries featuring cats that think they are human. Leash training tips for cats! Hahahahahaha! Woofmew@aol.com and Bun and Ming who also say MrrowHahahahahaha!! To be a cat!!! I'm so tired getting all the kitties their DIN DIN, that I skip mine many nights!!!!!!!! I really enjoy this series and am looking forward to the newest installment. Thank you for the chance! I'll email you for your address. THANKS, EVERYONE, FOR YOUR INTEREST!